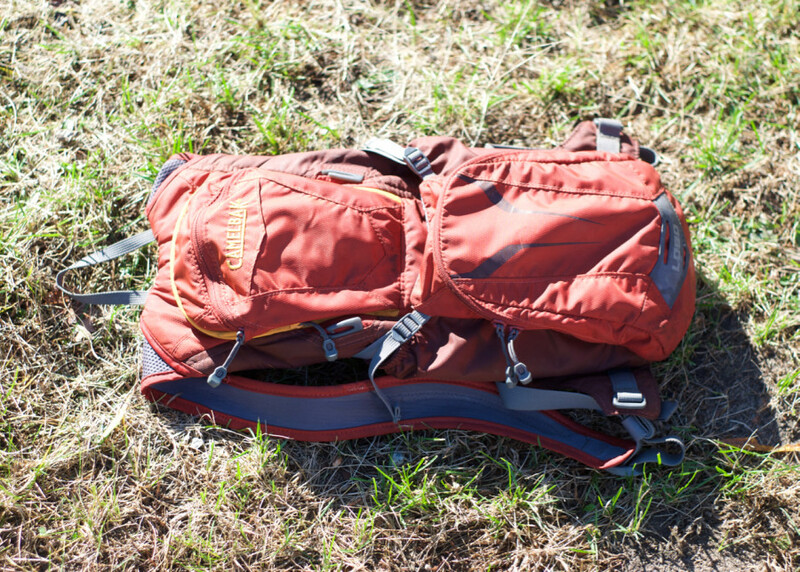 This pack is designed for somebody that wants to carry a lot of water without packing lots of extra gear. It still fits all the tools and gear that I need for racing long distances or spending hours out on the trail without running out of water. This could be considered the minimalists version of a high water capacity hydration pack. I bought this pack because of the 100 oz / 3 L water capacity and the fact that it was not a large and bulky day pack. I was getting into long distance endurance racing and needed the larger water capacity without the bulk of a day pack. That being said, I can carry more in this pack than what Camelbak advertises. 100 oz / 3 L bladder – The bladder is long and narrow with a vertical running baffle in it to keep water from sloshing side to side and stop the bladder from bulking out when full. I was afraid of a large capacity hydration pack having a big bulking feel on my back and the tall narrow bladder keeps the water load running up and down your entire back versus sitting in one spot. External fill – This is a great feature! You can fill this thing without having to remove the water bladder. I use this feature all the time during endurance races. When I pull into an aid station, all I have to do is unzip the water bladder pocket that exposes the large 1/4 turn water fill and top off the bladder. Removable belt straps – I removed these, because I don’t like the straps around my belly and they get in the way of reaching into my jersey pockets. They are attached by strong velcro and were easy to remove. Helmet hooks – I’ve only used these on occasion. Theoretically, you would be wearing your helmet while using the pack. I have hung my helmet on these a couple times just so that I knew I had my helmet with me when packing the car, but if my pack is on for a ride, then I am wearing my helmet. Upper zipper pocket – Includes an internal mesh pocket to separate things. This is usually were my phone, wallet or a couple extra food bars would go. Lower zipper pocket – Includes a hook for keys, mesh organizer pockets and another separator pocket. I store quite a bit of stuff in here for the size of it. It fits my keys, a couple CO2 cartridges, CO2 nozzle, multi-tool, patch kit, spare derailer hanger, zip ties and a roll of electrical tape. Cinch pocket – There is another pocket on the outside that cinches tight with straps that I keep a spare tube in and mini pump. It actually has straps within to hold the mini pump. This pack was exactly what I was looking for when I bought it and have no complaints. It fit a little more gear than what they advertised, yet not too bulky for such a large capacity bladder.